PonderIt: We Feel So Famous! It was fun to be featured in an interview at the Blogger of Jared. Thanks again to Eric for inviting Keryn and me to participate. It is amazing to me how broad the reach of something as simple as our blog can be. Keryn and I have loved having Google Analytics installed for our site. It gives us a sense for how many humans visit our site each day (as opposed to web crawlers). 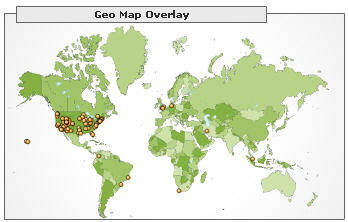 One of my favorite things to look at is the map of locations where we get visitors from. The map shown here is an indication of where we've had visitors from during the past week. This includes both our religious blog and our political one, though mostly only people from Utah read the political blog. You guys were a great interview. Feel free to e-mail me any suggestions on the next victims. Oh, and people like you should be a little famous.